Iqama transfer is also known as nakal kafala in arabic. All the information about your sponsorship change is written in this post. Now a days it is very easy to change your sponsorship if your kafeel is agree. Iqama Transfer / Change of Sponsorship / Nakal Kafala are same. When you move to another company or go to other kafeel then you must have to change your sponsorship to that company or kafeel. It was easy to check iqama transfer status online before on MOI absher accountbut after update of MOI website this feature has been gone. So in this post we will tell you about when you apply for Iqama Transfer then how can you check the status of iqama transfer/sponsorship in very simple steps. 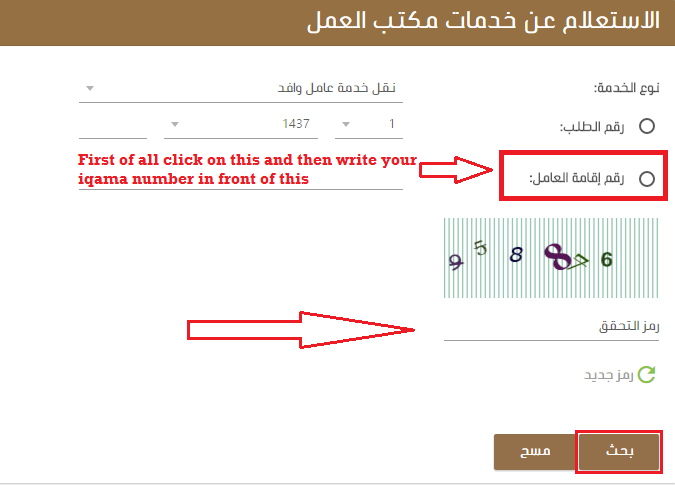 Although Ministry of labor website is in Arabic but we will explain the very simple procedure. Now the web page has been opened in Arabic so follow me, As shown in below picture click on the 4th option that is written in Arabic like this [نقل خدمة عامل وافد]. 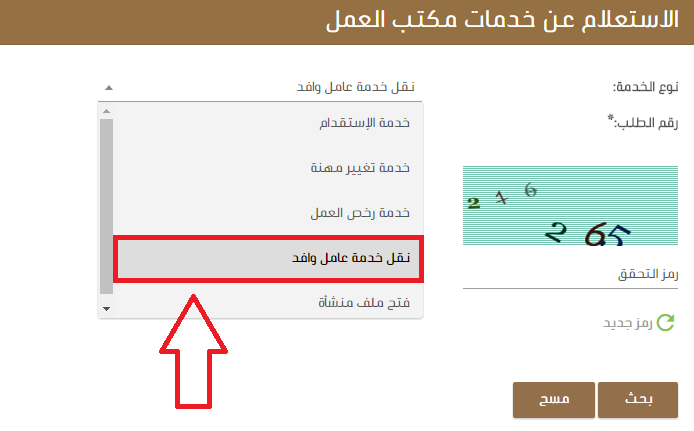 Now you will see other options and already ticked on [رقم الطلب], but you have to click on below option [رقم إقامة العامل] as shown in below picture. Enter image code where in Arabic [ادخل رمز التحقق] is written and click on below right side button written in Arabic [بحث] as shown in above picture. Now you are done, scroll down and see at the bottom of the web page. Your all information would be written in Arabic there which you can change by translating your page in English. Your current employer can stop all the process after issuing letter also as per Saudi Labor Law. Within 5 days he can stop your transfer by giving any reasons to athourities. As per Saudi Labor Law, your sponsor will pay the charges of first iqama transfer and if you are transferring your iqama 3rd time then half charges you should pay. Where if you are going to transfer your iqama for the first time then it would be 2000SAR. and for second transfer it would be 4000 SAR and for third transfer, it would be 6000 SAR. If you have any issues related to your transfer kindly comment below. how to get new iqama after transfer? Do not worry about this, your new sponsor is responsible for that.